Perfectly pamper skin with ORIGINS Smoothing Souffle Whipped body cream, a stimulating body cream that works to replenish moisture for touchably soft, silky smooth results. Infused with a nourishing blend of oils, including Olive Oil, Grape Seed, Rice Bran and Apricot Kernel Oil, the fast-absorbing formula delivers hydration from top to toe. Ideal for use on all skin types, the weightless cream subtly fragrances skin with refreshing notes of Peppermint, Spearmint, Orange and Rosemary. Active Ingredients: Olive Oil, Grape Seed Oil, Rice Bran Oil, Apricot Kernel Oil. ORIGINS Smoothing Souffle Whipped body cream 200ml was found on 2 websites and was price compared using EAN: 0717334208988. 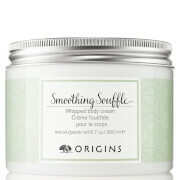 The cheapest ORIGINS Smoothing Souffle Whipped body cream 200ml is shown as the main item, prices range from £29.00 to £29.00, excluding delivery. Price comparison based on price and delivery charges, with any valid discount codes being applied, is shown in the table above. Prices and information correct at the time of publication.